By now you’ve probably seen the video clip of the cringe-worthy moment at The Oscars. The wrong movie was awarded Picture of the Year. La La Land? No. The award goes to Moonlight. How does something like that happen? And could more proactive planning and better compliance with recommendations have prevented such an awkward moment? Obviously, The Oscars flub is hardly a life-or-death situation. But the internet is buzzing with theories about what went wrong, and what the Academy of Motion Picture Arts and Sciences is going to do about it. After all, this is the first time in the organization’s 90-year history that Picture of the Year was erroneously given to the wrong winner at the Academy Awards. What happened in the months, days, and hours leading up to The Oscars to cause such a mistake? When you look at the circumstances, it’s a lot like the fifty-year-old, overweight, overworked guy with no medical history who suddenly drops dead of a heart attack. It’s a shocker for family, friends, and co-workers. But it’s also a reminder that a little preventive care, long before a cardiac event, could save someone’s life. 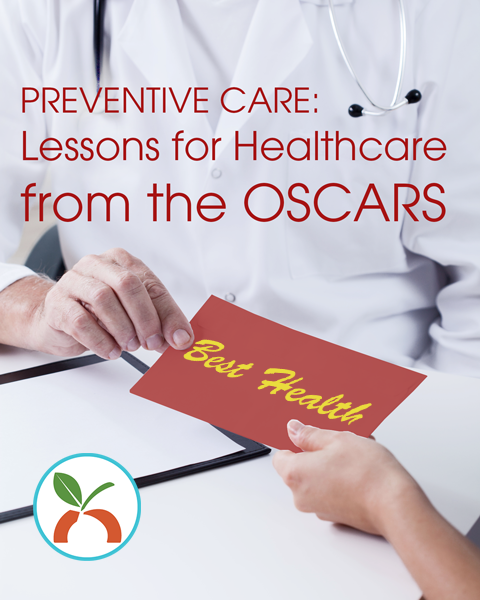 Like any smart organization that applies the principles of Six Sigma, you can be sure Academy Awards organizers are going to scrutinize every detail that contributed to the mistake. Already, fingers have pointed to PricewaterhouseCoopers (the accounting firm that counts the ballots for The Oscars) for the mix up. At this point, it’s all water under the bridge. What really matters is what the Academy Awards and PwC will do next to prevent an embarrassing moment like this from happening again. Over the years, the Academy Awards has developed a near-failsafe process to ensure the awards program runs smoothly. It’s done a good job at identifying risks to prevent something bad from happening. Heart disease is the leading cause of death in the United States and claims the lives of an estimated 615,000 people a year. Every 40 seconds someone has a heart attack or stroke. Some die. Some survive and face years of rehabilitation, physical therapy, and costly medical care. An estimated 75 percent of all adults are overweight or obese. An epidemic that the American Medical Association now recognizes as a chronic disease. About 29 million people in the United States have diabetes. Another 79 million have prediabetes. Left untreated, it can lead to blindness, kidney failure, vision loss, poor circulation, a heart attack or stroke. Less than 50 percent of adults get 30 minutes of exercise a day. Only 13 percent of adults eat the recommended amount of fruit per day. Vegetables: Only 9 percent eat the recommended amount. About 75 million adults have high blood pressure, or 1 in 3 adults. And many don’t even know it. Treating high blood pressure alone costs an estimated $46 billion a year. The Academy Awards is bound to find contributing factors that caused The Oscars mix-up that goes beyond an accountant being momentarily distracted by sending a tweet just before handing over the envelope. They’ll also find that with the right plan in place, a mistake like that is almost entirely preventable. And the same is true for chronic disease. For decades, we’ve been fighting an uphill battle against chronic disease in the United States. And it doesn’t seem to be getting better. Healthcare spending will top $3.2 trillion this year, and 86 percent of that will go to treating chronic diseases. Yet the vast majority of chronic diseases are preventable. A simple biometric screening, health risk assessment, and annual wellness visit can help an individual identify health problems before they become life-or-death situations. And the same data can inform your organization of health risks unique to your population. Data from a biometric screening and health risk assessments give you a complete picture of health, identifies risk factors for disease, and examines lifestyle habits like exercise, food choices, sleep habits, stress, and social engagement. When you can see all the factors that play into rising healthcare costs, you can do something about it. And that needs to start long before a trip to the emergency room or the last award of the night. But preventing chronic disease doesn’t stop there. Even though the Academy Awards had a no-smartphone policy in place, it wasn’t enough to prevent The Oscars mix-up. Their next move will likely involve establishing expectations for compliance to prevent a similar problem. In the wellness industry, we look at health risk data for an individual, or a population. Then we develop interventions and garner participation to change behaviors and improve health outcomes. But it’s never a one-and-done process. And that may be where the Academy Awards fell short. The guy who sent a tweet of Emma Stone probably knew the rules, but did it anyway. It’s similar to the path that leads to chronic disease. Most people know lack of exercise and poor eating habits are bad. But too many keep making bad food choices and prefer watching TV to going for a walk. And if they’ve completed a health risk assessment or been to the doctor, for example, they know the consequences. So how do you change this? No doubt a question the Academy will be asking to plan for next year’s Oscars. But in terms of preventive care, wellness, and disease prevention, what do you need besides health risk assessment, data, interventions, and participation to change behaviors and health outcomes? And the winner is… engagement. The more engaged your population is, the more likely people are to pay attention to their health scores, participate in interventions, and make behavior changes for better health. A lesson the Academy Awards can learn from to prevent another tweet and envelope mix-up during The Oscars. What impact has wellness and preventive care had on your population? Let us know in the comments below.